All about India Vs England women series schedule and squad. Having returned for a mixed New Zealand sojourn, one that saw them comprehensively defeat the homes side in the ODI series before being on the other side of the results in the T20 series, the Indian women cricket team is set to resume its action on the field come February 22 when the side will play host to England for a three-match ODI series. All the matches will be contested at the expansive Wankhede Stadium in Mumbai with the second ODI being played on February 25 and the third match being held on February 28. The 3 matches will be part of the ICC’s league which will play a major role in deciding the teams to directly qualify for the 2021 ICC ODI Cricket World Cup. Triumphing against New Zealand 2-1 in the recently concluded series did massive favours to the Indian side, propelling them to number 3 and the England series offers them a major incentive to keep moving up in the ranks with another comprehensive series win. For India, the English series also holds massive ramifications while they keep up the pace with direct qualification process for the world cup to be contested in New Zealand 2 years later with the side more than likely to forfeit an upcoming clash against Pakistan. India’s decision to give the fixture a go will see Pakistan end up with 6 points in their favour, a huge points swing which could see India step down to 4th if they don’t manage to defeat England in the upcoming series. Pakistan also has the same 12 points as India in the current league based system but India pips them to the 3rd spot with a better net run rate. The top 4 sides will qualify directly for the world cup with New Zealand already assured of their berth them being the host nation. The side will subsequently also go onto play a 3 match T20 series that begins on March 4, coming to a culmination on March 9. All the matches will begin at 10:00 am IST. Ahead of the 3 match ODI series which promises to be a riveting affair given the quality and immense cricketing star performers, the All-India Women’s Selection Committee has revealed the 14 member squad which will face England along with the side which will play a warm-up match preceding the series on 18th February. The matches will be broadcasted on Star Sports 1, Hindi/HD with the ODI series slated to get underway at 9:00 am IST while the 3 T20s will each begin at 10:00 am IST. 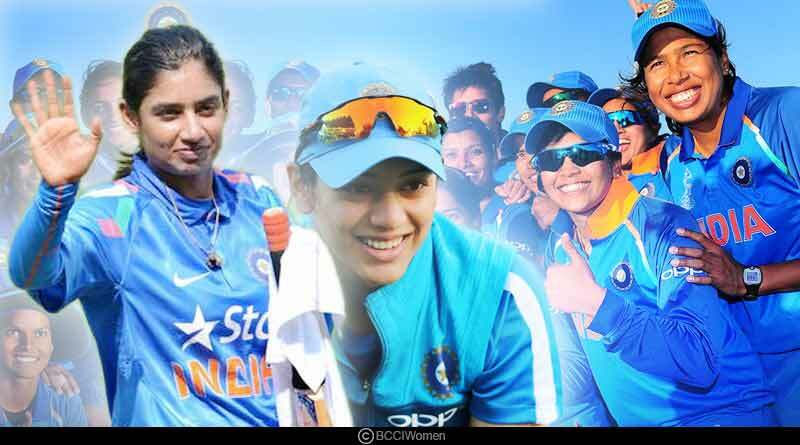 Indian Squad For The England ODI Series: Mithali Raj (Captain), Jhulan Goswami, Smriti Mandhana, Jemimah Rodrigues, Harmanpreet Kaur, Deepti Sharma, Taniya Bhatia (wicket-keeper), R Kalpana (wicket-keeper), Mona Meshram, Ekta Bisht, Rajeshwari Gayakwad, Poonam Yadav, Shikha Pandey, Mansi Joshi, Punam Raut. Team Picked Up For One-Day Warm Match Against England: Board President’s XI: Smriti Mandhana (Captain), Veda Krishnamurthy, Devika Vaidya, S Meghana, Bharati Fulmali, Komal Zanzad, R Kalpana, Priya Punia, Harleen Deol, Reemalaxmi Ekka, Manali Dakshini, Minnu Mani, Tanuja Kanwar. For more articles like India Vs England women series schedule and squad, do Subscribe to our newsletter and follow us on Facebook, Twitter and Google+.